A camcorder is a portable electronic device (generally a digital camera) for recording video images and audio onto a storage device. The camcorder contains both camera and recorder in one unit, hence its portmanteau name. This compares to previous technology where they would be separate. Prior to the introduction of the camcorder, the video camera and the VCR were two separate devices. While video cameras could in theory be hooked up to any VCR, a special portable VCR was needed to make recordings elsewhere. The portable VCR consisted of the cassette player/recorder unit, and a television tuner unit. The cassette unit could be detached and carried with the user for video recording. While the camera itself could be quite compact, the fact that the VCR had to be carried made the unit quite bulky. In 1984, Kodak introduced the first camcorder. A year later Sony introduced the first HandyCam model (but nowadays, a handycam is a generic name, because is used by other companies, like Panasonic). Video cameras were originally designed for broadcasting television images--see television camera. At first, most camcorders were VHS with some Betamax models. When camcorders were first put on the market they were large devices that required a person to support the bulk with their shoulder. Usually it was the right shoulder, but some cameras were designed for either left or right handed people. Eventually the VHS-C format was introduced, which used a compact cassette that held VHS tape. The VHS-C could record about 1/2 hour at a time. This new format could be played in regular VHS VCRs with an adapter. It also allowed manufacturers to make a smaller camcorder that did not need to be supported on the shoulders. At about the same time, the 8mm format was introduced. The cassettes for 8mm were even smaller than VHS-C devices. The video was of higher quality than VHS or VHS-C camcorders and 8mm tapes could record up to two hours. But because the tape was of a different size, it's not possible to play 8mm tapes in a VHS VCR - the tape is much smaller than VHS tape. 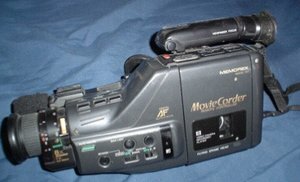 In most cases people would connect the camcorder to their home VCR, and copy their recordings on to a VHS tape. 8mm then became the dominant format for camcorders, a position it would hold until MiniDV and DVD camcorders came on to the market. With the advent of MiniDV, it was possible to make camcorders even smaller than was possible with the 8mm format due to the small size of the casettes. Such camcorders can make digital quality recordings on the tapes. Over time, the camcorder has not only decreased in size, but has dropped in price as well. When camcorders were first introduced, the devices were bulky shoulder mounted devices that cost over $1500 dollars. Modern camcorders - especially MiniDV devices - are small enough to fit in the palm of a person's hand and have a starting price of under $300 dollars. Video is captured by way of the camera lens, and is sent to a CCD (charge-coupled device), possibly processed, compressed, and then to final storage. We can generally distinguish between digital and analog camcorders. The market share for digital models is continually increasing, as models become cheaper and better quality. Any recent Personal Computer can be made into a digital video editing machine with the use of digital editing software - a light version with limited features is often included with digital cameras. There are various storage devices and respective formats for camcorders, please see the video page for details. The latest camcorders also record on a flash memory device (in MPEG-1, MPEG-2 or MPEG-4) or directly on DVD (either DVD-RAM or DVD-R) in MPEG-2 format. Other digital tape recorders transfer their video content in DV format over a IEEE 1394 connection to a computer, where the huge files (approx. 2GB for 5 minutes on PAL DVD resolution) need to be edited and compressed or played back on tape. The transfer speed is currently 1x, which means one hour footage needs one hour to transfer. Besides classification in analog and digital camcorders, they can also be classified by consumer products, semi-professional products and broadcast quality products. Product cycles are 6-12 months, 2-4 years and 5+ years respectively. They can also be used to record personal events for future reminiscing, or even as an artistic tool. Digital8, that uses Hi8 tapes (Sony is the only company that produces D8 camcorders). 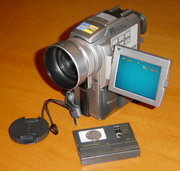 MicroMV (Sony is the only electronics manufacturer for this format). DVD (with the biggest market increases): Mini DVD-R and DVD-RAM. This is a multi-manufacturer standard. PXL-2000 -- A toy camcorder that used compact audio cassette to store video.